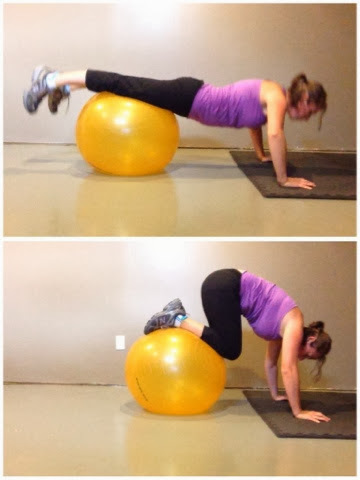 Did you know that a stability ball can do more for your workouts than just sitting on it to do crunches? Well get excited and take it out of your closet because there is almost an unlimited amount of exercises you can do with it! 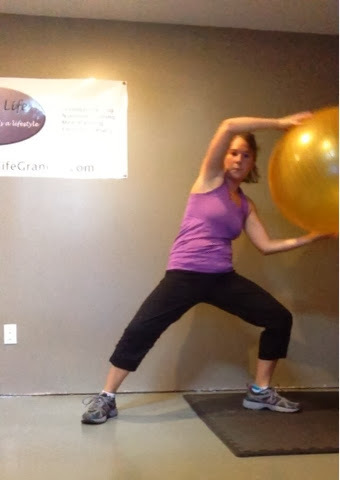 But first I want to share just 3 benefits of using a ball instead of no equipment. 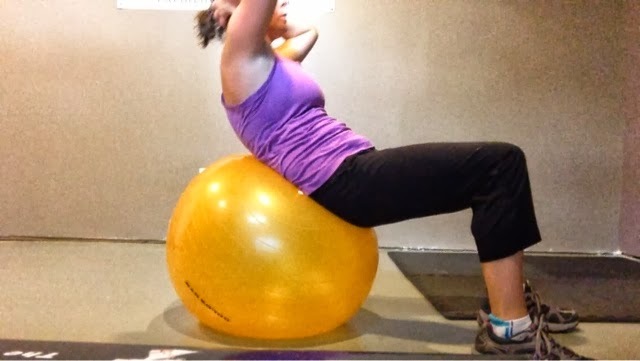 #3 Lifting, lunging and twisting with a ball causes an increased heart rate, more blood circulation, and exhausts muscles sooner...which means a harder and more effective workout! 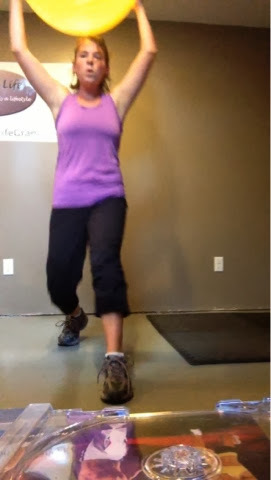 Warm-up: Get the blood flowing for 3-5 minutes with squats, jogging in place, jumprope, briskwalking, very light weights. 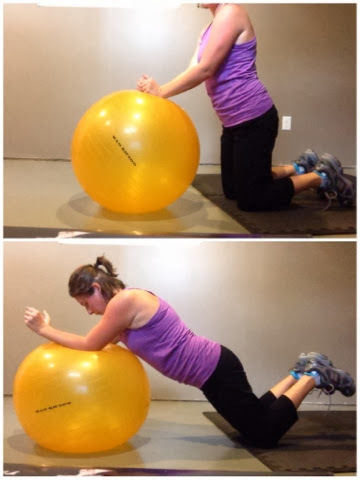 You can even squat with your ball if you'd like. Light stretching as well. 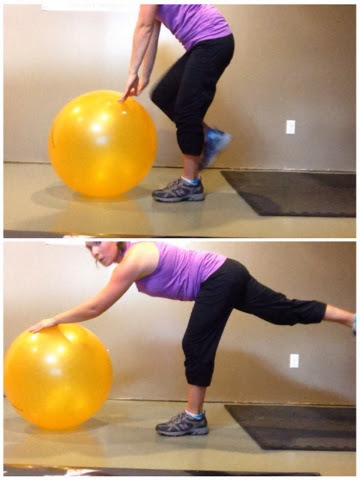 Lunge with ball rotation. Keep your knee over the ankle. 10-15 each leg. The "wheel." Bring the ball to the shoulder and lift over head to the other shoulder. 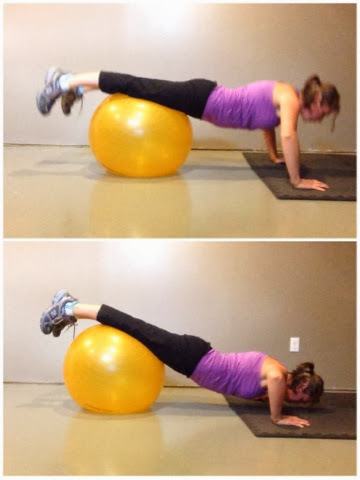 Keep your tummy tucked and abs sucked in tight so you work your stomach **This is important* Do 10. One leg balance. 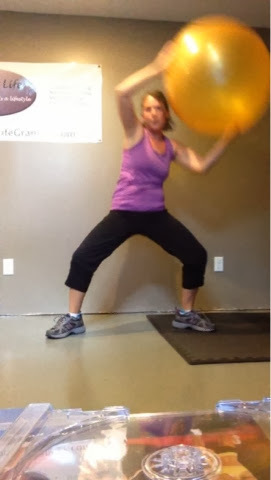 Have one hand out to the side for balance or put both hands on the ball to make it more difficult. Keep one leg lifted, roll ball out and bring it back in. Do 8 each leg. Push-ups! The farther you roll out, the more difficult. 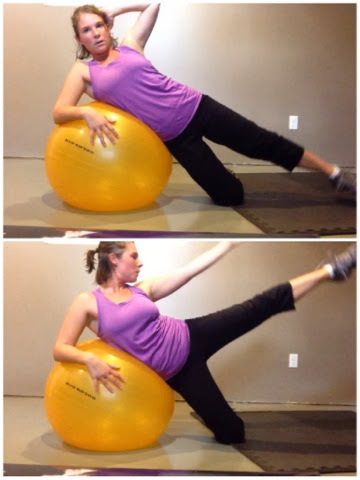 So a great way to improve your strength is starting with the ball on your stomach and rolling out closer to your feet. Do as many as possible. Modified pike. Get in your plank position and bring the legs in to your stomach. Do 8-10. Side crunch. Pretty self explanatory by the picture. Do 10 each side. Taking the Side Crunch to the next level and straightening the arm as well. Do 10 each side. Ab Roller. Keep your body a rigid piece, roll out and back. Do 5-10. Your abs should be screaming with all this work. 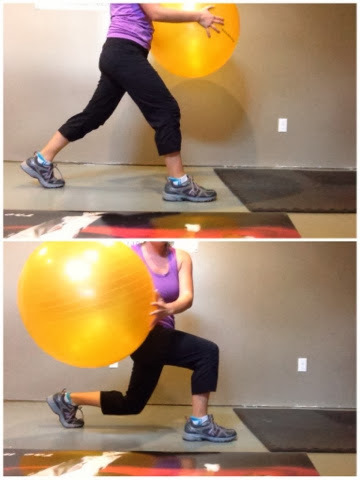 Now get up and lunge while lifting the ball overhead as you're lunging forward. Do 10 each leg. Then get down and crunch. 20 crunches.